Live chat with me tomorrow. The title of this post sounds weirdly like one of those sketchy chat lines, doesn't it? Ick. Well, I didn't mean it to sound like that. It's all actually quite innocent. Well... kind of. It could be potentially dangerous. News 8 Austin asked me to be one of the hosts for their live, online Oscar chat tomorrow from 6 p.m. to 7 p.m. If you're not doing anything, why don't you join me? 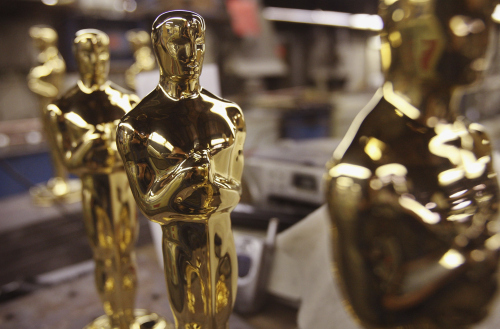 Here's a photo of some Oscars because I've never made a post without a photo. Join me online tomorrow for my witticisms about the fashion at the Academy Awards. Y'all know I'm pretty much the Joan Rivers of Austin, right? It should be hilarious. Well, maybe. Hopefully. Join me, and we shall see!